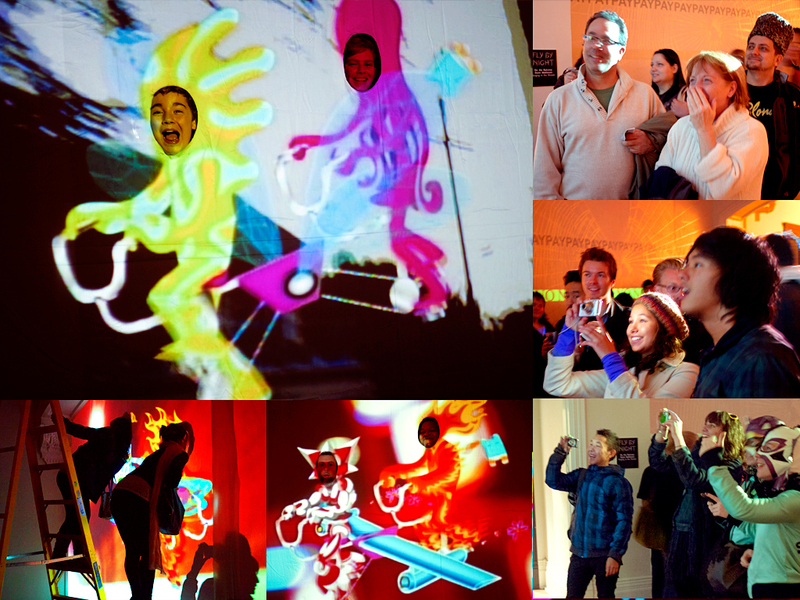 Photos from the installation at Nuit Blanche. What is free will and self determinism in the context of variables such as chance or karma? Why does life seem like such a wild, unpredictable ride and yet culture and history have such strong and recurring patterns? These questions become easier when we imagine that we are more like interchangeable characters playing out archetypal roles in a larger production and less like insular individuals with completely distinct personalities and unique destinites. More than the size of the role in the story, our decision to throw ourselves into whichever role with gusto is what determines the quality of our experience. 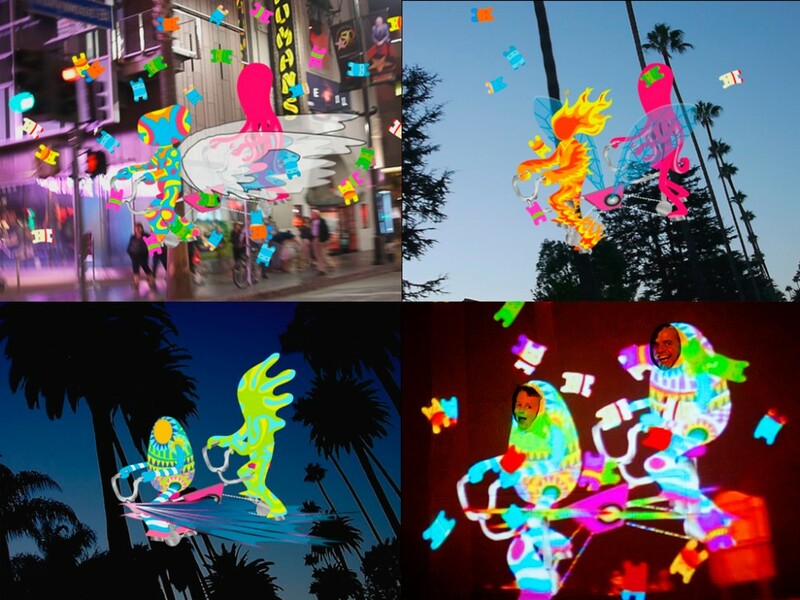 Tandem Flight is an immersive video installation that combines cartoon animation of monsters on a flying tandem bicycle with video footage of Los Angeles streets at night. In the artpiece audience members are invited to venture behind the screen and assume the role of the characters projected on the front by putting their faces into holes that are cut in the screen. Taking a cue from video games in which the subject stays at the centre and it is the background that moves, a swooping flight is possible even as the faces remain in constant position. Incidentally, this echoes various models of consciousness. 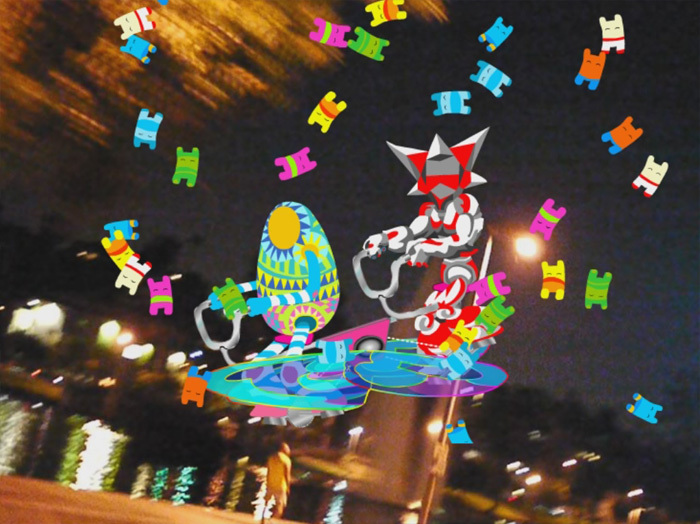 Still from Tandem Flight by Magda Wojtyra and Marc Ngui. 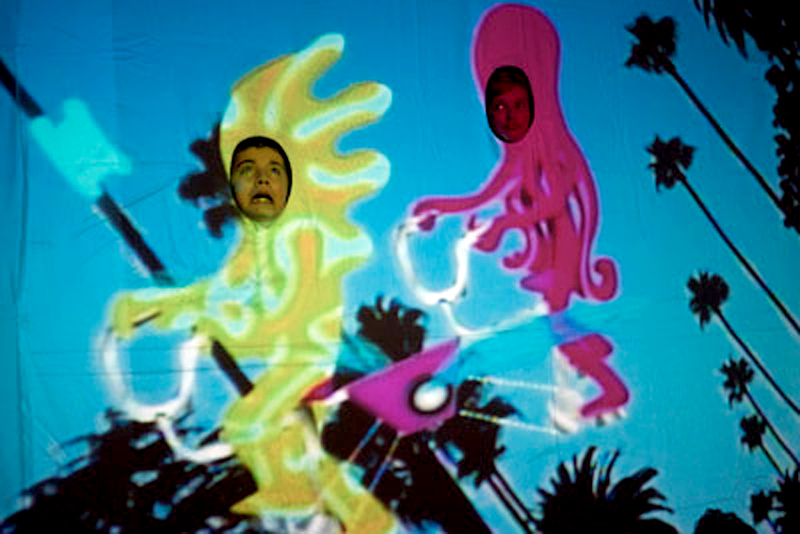 Vector animation, video, screen with holes for audience faces, platforms/ladders, dimensions vary, 5 minute loop , 2010. Photo from Tandem Flight as installed for Nuit Blanche 2010. Magda Wojtyra and Marc Ngui,ector animation, video, screen with holes for audience faces, platforms/ladders, dimensions vary, 5 minute loop , 2010. Photos from the Nuit Blanche installation at the Gladstone Hotel in Toronto, 2 October 2010. Tandem Flight front and back of the screen from Happy Sleepy on Vimeo. The video runs on a five minute loop. During this time five sets of wings – goose, fly, dragon, jet, and butterfly – change regularly every minute, and nine different monsters – ranging from purple octopus to fireball to mechanical abstraction – interchange on a random schedule ranging from 1 to 20 seconds. You just don’t know what you’re going to get or who you’re going to be when you step up and put your face into the screen. Furthermore, although the projection was visible from the front and back of the screen, once a viewer is “in”, the screen is no longer visible. You’re either an observer or an actor, and audience members predictably often made this transition by becoming very animated, making faces, calling out or even heckling the audience in front, and sometimes assuming full character with banter to their cycling partner about the scenery they were traversing and the journey they were on. Some younger viewers also “pedalled” their legs that were left dangling when they were lifted up to put their face in the hole. Read more on the Tandem Flight project page.